Posters made from Maxis book covers, magazines and neigbourhood billboards. 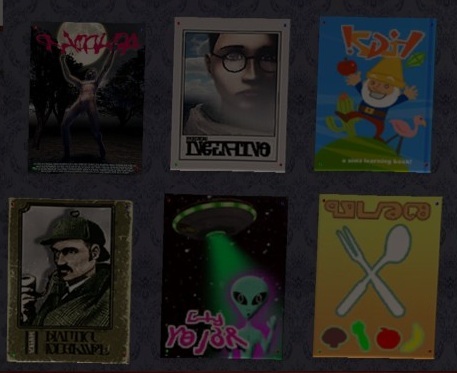 The book posters (top picture) are recolours of the Freetime movie poster. 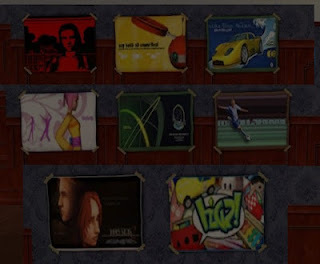 The billboard posters (middle picture) are recolours of "Engineered Angst in Red" from the Base Game. the Magazine posters (bottom picture) are recolours of the Freetime movie poster. I really like your creations, but none of the download links are working! Links should all be fixed now! Such a neat idea. Thank you!